Delayed Mathematics | OFF KLTR! Of course I’ve seen with my own eyes a huge shift in my big girl’s emotional well-being in the past year, but somehow a scientific study still feels validating. 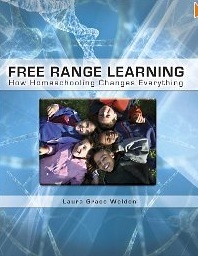 I have been reading Free Range Learning How Homeschooling Changes Everything by Laura Grace Weldon. The book is just packed with information! It’s almost like a reference book. BUT it’s a reference book that gets me even more excited about our bright homeschooling future – and all the opportunities available to our family!! I think that early academics are stressful for children. That is (in my opinion, of course) actually the single greatest strength of Waldorf education, its protection of childhood and the importance of – and respect for – play in the early childhood classrooms. BUT, while preschool and kindergarten are entirely play based, the Waldorf Schools really don’t leave much time for play during the early elementary years. And to me, that complete shift from all play in kindergarten to all academics (even with art, music, and movement woven in) in first grade, just felt wrong. And now that I have the privilege of homeschooling my big girl, it has become incredibly apparent that so much learning happens through play – even in first grade (but really, c’mon – duh! – of course first graders still need to play!). And while my first grader has a great desire to learn to read, she’s never breathed a word about learning math operations! And I had been a little worried; wondering if I should be pushing some kind of math equivalent to Explode the Code. But I just felt like she wasn’t really ready for formal math. And this wonderful book – Free Range Learning – gave me more confidence in my instinct to delay formal math instruction! Lauren Grace Weldon describes how different learning is for homeschoolers. She explains, “parents provide an enriching environment that stimulates learning without pushing a child before he’s ready. In many countries around the world it is recognized that the brain simply does not mature sufficiently for abstract concepts until the child is older. …Math, reading and other topics can be folded into activities of the day and learned with gradual ease. (Some homeschooled children) do not read, write or calculate until much later than their schooled peers, some do not until they are ten or twelve years old. These children learn reading or math in their own way, for their own reasons. In a matter of months, they pass where they ‘should’ have been if they’d started years before. And they love what their doing. …So Benezet tried an experiment of abandoning traditional arithmetic instruction below the seventh grade. To start, he picked out five classrooms, choosing those districts where most of the students were from immigrant homes and the parents spoke little English. Benezet knew that in other districts the parents with greater English skills and higher education would have vehemently objected, ending the experiment before it started. In the experimental classrooms, children were exposed to what we would call naturally occurring math. They learned to tell time and keep track of the date on the calendar. The students played with toy money, took part in games using numbers, and when dimensions terms such as ‘half’ or ‘double’ or ‘narrow’ or ‘wider’ came up incidentally, they were discussed. Instead of math, the emphasis was on language and composition. As Benezet describes these children, ‘they reported on books that they had read, on incidents which they had seen, on visits they had made. They told stores of movies that they had attended and they made up romances on the spur of the moment. It was refreshing to go into one of these rooms. A happy and joyous spirit pervaded them. The children were no longer under the restraint of learning multiplication tables or struggling with long division. …Benezet hung a reproduction of a well-known painting in the classrooms and asked children to write down anything the art inspired. Another obvious contrast appeared. When he showed the ten best papers from each room to the city’s seventh grade teachers, they noted that one set of papers showed much greater maturity and command of the language. They observed that the first set of papers had a total of 40 adjectives such as nice, pretty, blue, green and cold. The second set of papers had 128 adjectives, including magnificent, awe-inspiring, unique and majestic. …Those students who wrote the most masterfully were from his experimental classes. Yet another difference was apparent. …At the end of that first year, he (Benezet) went fr0m classroom to classroom and asked children the same mathematical story problem. The traditionally taught students grabbed at numbers but came up with few correct results, while the experimental students reasoned out correct answers eagerly, despite having minimal exposure to formal math. Based on the success, the experiment expanded. by 1932, half of the third- to fifth-grade classes in the city operated under the experimental program. Due to pressure from some school principals, children were started on a math book in the second half of sixth grade. All sixth-grade children were tested. By the spring of that year, all the classes tested equally. When the final tests were given at the end of the school year, one of the experimental groups led the city. In other words, those children exposed to traditional math curricula for (only) part of the sixth grade year had mastered the same skills as those who had spent years on drills, times tables and exams. (As we know, schools have NOT gone in this direction in terms of math instruction!) …However, homeschoolers can easily take this more natural course, aware that the concepts can be readily grasped in short order, just as Benezet proved” (Weldon, 24-26). Thanks so much for sharing this fascinating research by Benezet! It of course makes complete sense!